Added top of climb, top of descent and PNR annotations on route. PNR is calculated on the return to origin. User fixes can be deleted by tapping on the fix and selecting ‘Delete’ on the menu which appears. New printing capability, located under ‘Flight Planning’. Select plan, weather and charts to be printed/emailed/sent to another app. Forecasts can now be printed. Bulk import user waypoints from a CSV file. See below for the format. Share and download aircraft type models via www.avsoft.com.au/avplan/aircraft-model-database . Aircraft models can now be copied. METAR icons are colour coded for VFR/Low VFR/IFR/Low IFR (blue,green,yellow,red). 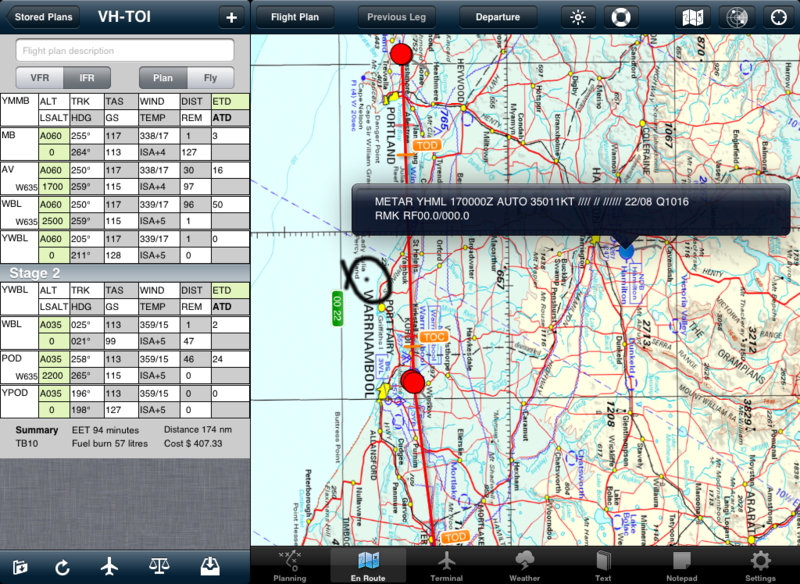 IFR routes are added using stored routes where specified via Airservices Australia. Improvements to the way the ‘rubber banding’ of routes is handled. Tap and hold anywhere along a route, and when the blue ring appears, drag it to a point to insert a new leg in a route. During the install the app will update, download and install new databases. This database update sets the app up for some exciting new features which will appear in 2012. Blue (VFR). Visibility > 8km, Cloud > 3000ft. Green (Marginal VFR). Vis > 5km, Cloud > 1000ft. Also included are a bundle of bug fixes, performance and stability improvements. As with all our releases since 1.5, if your trial period has expired, a new version will work for a number of days to give you the chance to see the new features in action.